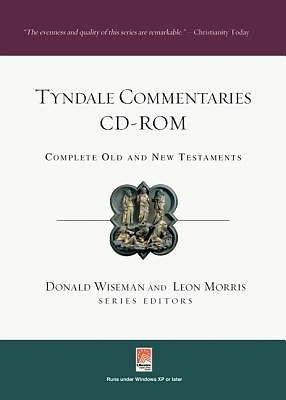 The Tyndale Commentaries have long been a trusted resource for Bible study, and now these forty-nine volumes, written by some of the world's most distinguished evangelical scholars, are available digitally to make your study of Scripture even easier. This powerful tool provides clear, reliable and relevant explanations of every book in the Old and New Testaments, all in a highly convenient searchable digital format and runs on Windows XP or later. Tyndale Old Testament Commentaries (TOTC) Genesis by Derek Kidner Exodus by R. Alan Cole Leviticus by R. K. Harrison Numbers by Gordon J. Wenham Deuteronomy by John A. Thompson Joshua by Richard S. Hess Judges & Ruth by Arthur E. Cundall and Leon Morris 1 & 2 Samuel by Joyce G. Baldwin 1 & 2 Kings by Donald J. Wiseman 1 Chronicles by Martin J. Selman 2 Chronicles by Martin J. Selman Ezra & Nehemiah by Derek Kidner Esther (1st ed.) by Joyce G. Baldwin Esther (2nd ed.) by Debra Reid Job by Francis I. Andersen Psalms 1-72 by Derek Kidner Psalms 73-150 by Derek Kidner Proverbs by Derek Kidner Ecclesiastes by Michael A. Eaton The Song of Solomon by G. Lloyd Carr Isaiah by J. Alec Motyer Jeremiah & Lamentations by R. K. Harrison Ezekiel by John B. Taylor Daniel by Joyce G. Baldwin Hosea by David Allan Hubbard Joel & Amos by David Allan Hubbard Obadiah, Jonah, Micah by T. Desmond Alexander, David W. Baker and Bruce Waltke Nahum, Habakkuk, Zephaniah by David W. Baker Haggai, Zechariah, Malachi by Joyce G. Baldwin Tyndale New Testament Commentaries (TNTC) Matthew by R. T. France Mark by R. Alan Cole Luke by Leon Morris John by Colin Kruse Acts by I. Howard Marshall Romans by F. F. Bruce 1 Corinthians by Leon Morris 2 Corinthians by Colin Kruse Galatians by R. Alan Cole Ephesians by Francis Foulkes Philippians by Ralph P. Martin Colossians & Philemon by N. T. Wright 1 & 2 Thessalonians by Leon Morris The Pastoral Epistles by Donald Guthrie Hebrews by Donald Guthrie James by Douglas Moo 1 Peter by Wayne Grudem 2 Peter & Jude by Michael Green The Letters of John by John R. W. Stott Revelation by Leon Morris SYSTEM INFORMATION: Works on Windows XP or higher, including Windows 7. Runs on the Libronix Digital Library System. 192 MB RAM is required. 512 MB RAM is recommended.